This premium Tea Party Bobblehead from Royal Bobbles is by far the highest quality Tea Party Bobblehead that has ever been produced. 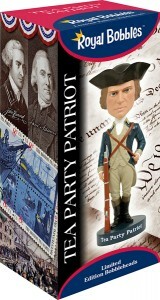 This model shows a Tea Party patriot in authentic colonial attire and colors. It was sculpted in the U.S. and it shows – the detail is remarkable. From the lifelike details on the musket, supply bag, and gunpowder pouch, to the clothing details, this is a product that any patriotic collector would be proud to own. It somes in a colorful, premium quality collectors box.